Heat grill. Beat egg in medium bowl. Add bread crumbs, onion, hot pepper sauce and tuna; mix well. Shape mixture into 4 patties, 3/4 inch thick. When ready to grill, place patties on gas grill over medium heat or on charcoal grill 4 to 6 inches from medium coals. Cook 8 to 10 minutes or until deep golden brown, turning once. Place lettuce on bottom halves of buns. Top each with patty, tomato and top half of bun. Serve with tartar sauce. To broil patties, place on broiler pan; broil 4 to 6 inches from heat using times above as a guide, turning once. 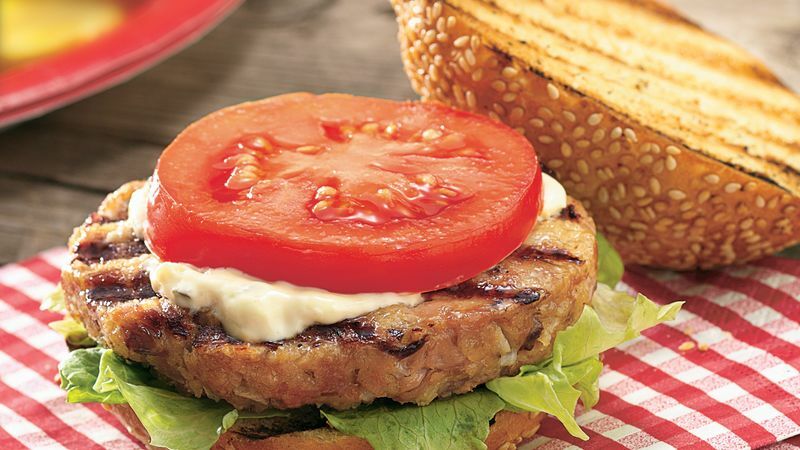 These burgers contain pantry staples you can have on hand for spur-of-the-moment grilling. For a zippier flavor, try seafood sauce in place of the tartar sauce. Try Kaiser rolls or sesame or poppy seed buns with these burgers. Toast the buns on the grill during the last 2 to 3 minutes of cooking time.